I recently (Aug 2017) set up a PiAware flight tracking receiver. The Pi in PiAware refers to a Raspberri Pi computer and the Aware is part of a larger concept by the FlightAware Company. In the case of PiAware volunteers purchase Raspberri Pi computers, a USB receiver module, antenna and coaxial cable. Since I already had a Raspberri Pi gathering dust I only had to purchase the receiver to start tracking. Here's a link if you would like more information. 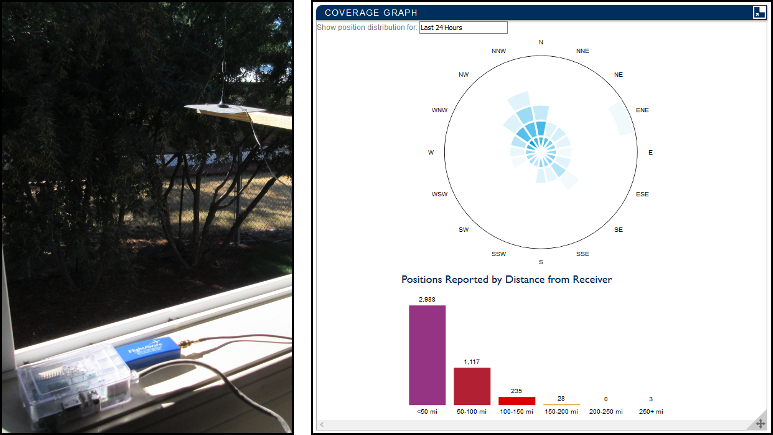 The photos and screen captures to the right document the receiving station and the antennas I deployed. The charts signify the number of aircraft picked up with each configuration. The radial charts give a clear indication of how the station performed as higher quality antennas were added. 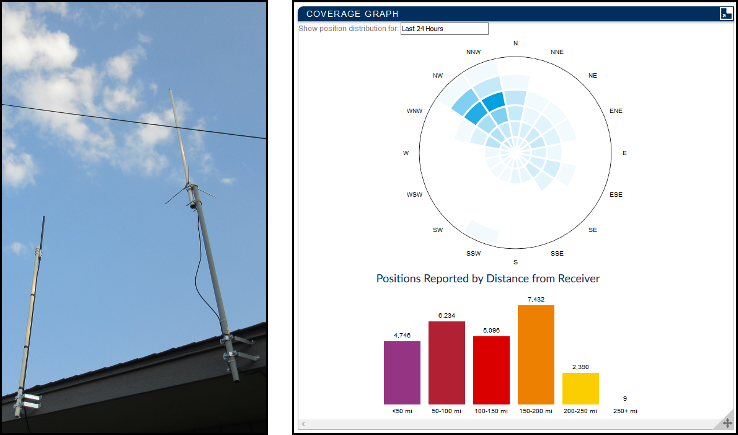 If you subscribe to the Amateur Radio Relay League publication QST, you might have read the article "Aircraft Tracking, Flight Aware, and How You You Can Be of Service" in the August 2017 issue. This caught my interest and led me to the PiAware web site. This is the first configuration that was simply the Raspberri Pi, FlightAware receiver and a piece of wire as the antenna. The chart on the right is a screen capture of the PiAware web site (comes with the software on Raspberri Pi). Notice the circle chart and the number of slices radiating from the center of the figure. The center represents my location. The first ring of slices indicates capture of less then 50 miles while the second ring out from the center indicates capture from 100 miles out. Ok, but not very far out. Also you'll notice very little activity from the west to the south. That's because of the Wallowa Mountains which block aircraft signals. This is the second configuration. It uses a small cell phone antenna. 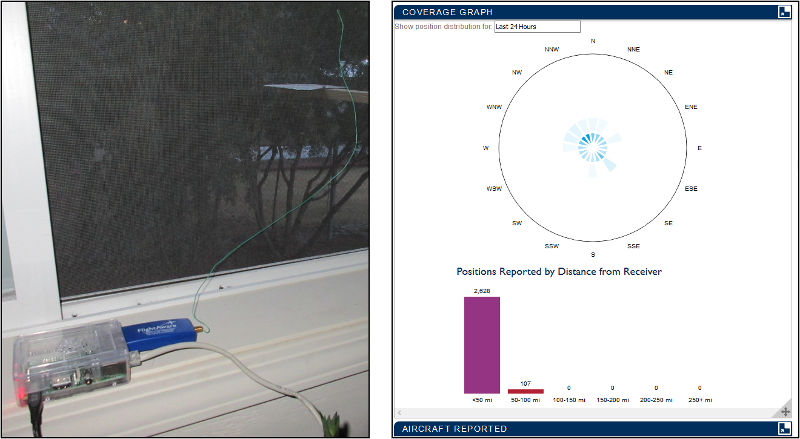 You can see the antenna outside the window on a homemade mount with a sheet metal ground plane. In the chart at the right you can see that the reception range has now moved out to four circles representing 200 miles. There is also one capture in the direction East/Northeast at 250 plus miles. Not bad for that tiny antenna. As in the previous chart the same pattern is evident of blockage from the mountains. This is the third configuration. The PiAware antenna is to the left. I used LMR-400 coaxial cable (for low signal loss). You can see that reception is out to 250 plus miles. Again, the same pattern is present with blockage from the mountains to south. This is the Raspberri Pi mounted on the wall with the LMR-400 coax attached. I added some padded hose clamps (not in the picture) to stabilize the coax and prevent damage to the receiver jack. And finally, this is a Postions Reported by Day chart. 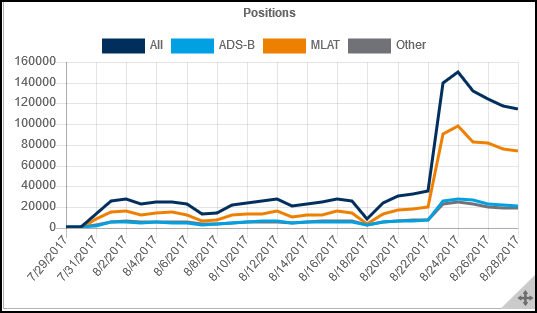 You can see the dramatic increase in positions on 8/24/2017 when I added the larger antenna.